The Salpointe Story is a case study about the use of cross-media marketing as an important part of the client’s overall $12 million dollar capital campaign. This presentation explores the campaign’s objectives, target audience, creative strategy, campaign architecture and workflow, key success factors, and results. Find out why donors couldn’t resist contributing to the proud legacy of this private Catholic high school in Tucson, Arizona. Why start a cross-media marketing campaign? Because everyone’s doing it? Well, not everyone is. Only hundreds of companies like Kodak, Harvard, Nike, Discovery Channel, and chances are, your competitor down the street. What is a cross-media marketing ("XMM") campaign? It’s an effective marketing tool - personalized, targeted, and relevant - with a compelling offer usually using PURLs (personalized URLs) to improve response. It’s designed for you to gain a conversation with new prospects. An accurate, current mailing list is the first critical piece to almost any marketing campaign. If possible, augment that list with additional demographic data. Not having a list or fearing your list may be inadequate, should not deter you from your marketing goals. Choose a mailing partner who can help you with your current list as well as strengthen it with added information. Today, customers expect to be able to respond electronically if they so choose. Establish an easy way for them to do just that – online or with their mobile devices. Don’t leave off the tried and true telephone, FAX, and even USPS mail. Drive customers to your website with a powerful message. It has to be pertinent and resonate with each recipient which is why your database is key. “One size fits all” actually fits no one. Your offer must be compelling enough to move people to action. Wimpy offers generate wimpy results. Monitor responses in real time and track the specific data about your prospects that you want to know. Armed with important prospect responses, you will be ready to respond to each of their specific needs. Contact your leads promptly and make that great, first impression. No longer make “cold calls.” Make more productive use of your time by asking pertinent questions and close the deal. When you choose Spectrum Printing Company, you are choosing a partner with the knowledge and experience to guide you through a cross-media marketing campaign designed to accomplish your marketing goals. 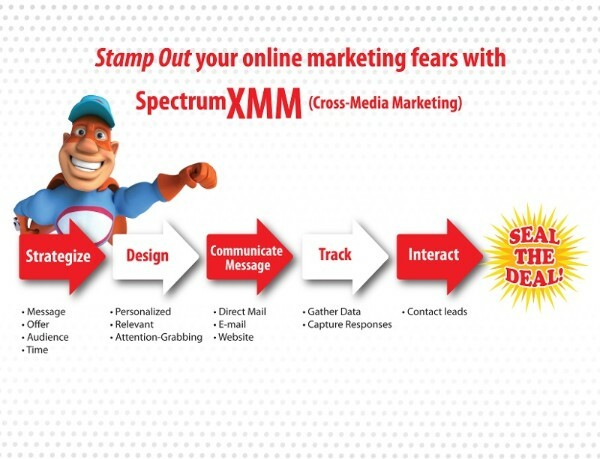 Ready to stamp-out your online marketing fears with cross-media marketing? Then you’re ready to work with SpectrumXMM, a cross-media marketing service that will help you seal the deal with new customers. Complete the form nearby or call us: (520) 571-1114. Start a Cross-Media Marketing Plan Now!